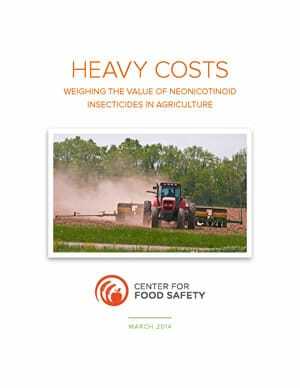 This report tackles the question: Are neonicotinoid insecticidal seed treatment products beneficial or not? Center for Food Safety reviewed and summarized 19 articles from scientific journals that studied the relationship between neonicotinoid treatments and actual yields of major US crops: canola, corn, dry beans, soybeans, and wheat. In sum, we found that numerous studies show neonicotinoid seed treatments do not provide significant yield benefits in many contexts. European reports of crop yields being maintained even after regional neonicotinoid bans corroborate this finding. Opinions from several independent experts reinforce that neonicotinoids are massively overused in the US, without a corresponding yield benefit, across numerous agricultural contexts. The bottom line is that toxic insecticides are being unnecessarily applied in most cases.